Kawashiri area where Takashimizu head office is located is blessed with good quality water. In Edo era, there was an anecdote that Lord Satake used this water for their tea parties. 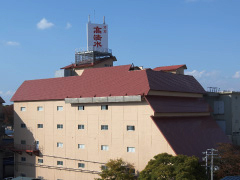 In 1978, one of breweries Senshu-Gura was established and it is a six-story building made of reinforced concrete. In spite of this relatively modern structure at that time, it is designed with a careful consideration in order to demonstrate fully our traditional handwork as much as possible. White rice for brewing is carried to the top floor at first, and the sake making process flows from the uppermost floor to the lower floors in its process order. Those efficiency was also considerated when being designed. Autumn in 2005, one small brewery was revived in the main brewery. 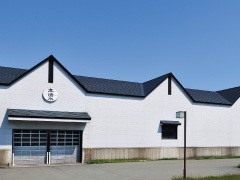 This small handmade brewery has a role to hand down our Takashimizu history to posterity. It was established in 1953 and the old pillars and beams was still the same as they were. For brushing up our current sake quality, for understanding Akita’s traditional sake brewing deeply with devoting into it, and for the “new tradition” which will succeed to the future. Those our wishes are contained in this brewery. Spirits and tradition of sake brewing from pastcraftmen, we pass down all of wisdom and always brew our best sake. Even while succeeding the traditional method of sake brewing, also introducing latest high-tech temperature controlling machine. Small, but skilled young brewers are working on sake brewing with this collaboration. Small size brewing makes the precise temperature control possible and as a result, we can meet the diverse customer’s tastes. Koji making, the key of sake making, is a result of a fusion of skilled brewmaster’s sense and the 24/7 high-tech temperature controlling system. Shubo making which is really complicated and takes lots of time and labor can be done under the quite desirable environment thanks to the latest computer management. In Moromi making, various fermentation can be implemented without being affected by any temperature and humidity change of outside. 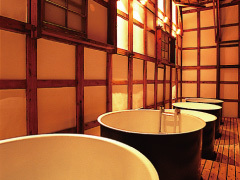 In the brewery, temperature is always kept below 15℃, and sake is stored and aged under this safe and comfortable condition thanks to the storage tank with the ability of freezing temperature storage. 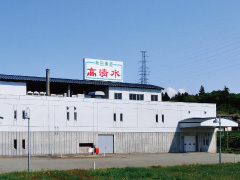 In order to deliver promised quality sake to our cusotmer constantly, we also put a great emphasis on rice polishing process, and we built our own polishing factory in 1990. The first step for good sake making is polishing good quality rice uniformly and beautifully as much as possible. For example, when the average polishing ratio is 50%, even though half of total amount of rice wasn’t polished off at all and the rest of half was totally crushed into powder, in terms of numerical data, it can be said “average polishing ratio is 50%”. However, in this condition, we never hope to make good sake with them. Of course this is too extreme example; however, conventional polishing machine had such a kind of problem; because of the heat generated by friction, dried rice promotes rice crushing and as a result, the actual polishing ratio became bad. As a solution for this problem, Takashimizu introduced fourteen latest technology polishing machines and one of them has the automatic humidification system for long-time polishing. Moreover, in addition to the basic automatic controlling system for each part of machine, we added our experienced skill’s data into this program for careful centralized controlling of each part. Namely, the fusion of handwork and computer technology makes it possible the further sophisticated rice polishing. With “Techno-Mill” (Technology milling) which is creating a future of sake, Takashimizu takes a new step for better sake brewing.